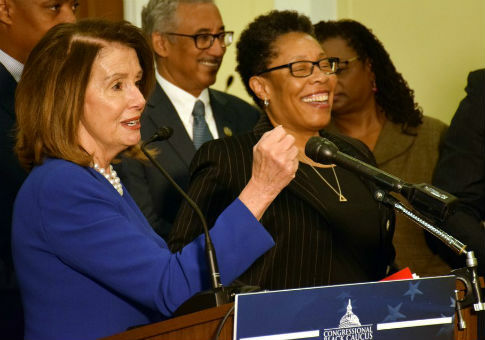 Rep. Marcia Fudge (D., Ohio) announced Tuesday she would be supporting House Minority Leader Nancy Pelosi's (D., Calif.) bid for speaker of the House just hours after Pelosi announced that she was planning to revive the House Administration subcommittee on elections and make Fudge the chair. "My consideration [for speaker] was due in large part to the lack of sustained efforts that ensure diversity, equity and inclusion at all levels of the House. Further, despite the great success we experienced on November 6, voter protection and voter integrity are still at risk," Fudge said. "The erosion of voting rights and civil rights was on full display in Georgia, Florida, North Dakota, Ohio, and Texas." She then mentioned how Pelosi had granted her the opportunity to "create the record necessary to satisfy the 2013 Supreme Court decision in Shelby County v. Holder, so that the protections of the Voting Rights Act will be reinstated and improved." "She has also assured me that the most loyal voting bloc in the Democratic party, Black women, will have a seat at the decision-making table," Fudge said. "I am now confident that we will move forward together and that the 117th Congress will be a Congress of which we can all be proud." Pelosi's assurance of black women having a seat at the decision-making table comes amid Fudge recently criticizing Pelosi for not being vocal enough about supporting African Americans in Congress. Fudge told the Huffington Post last week that she sees an "undertone of racism" in the Democratic caucus. "We’re not feeling the love," she said. Fudge, a former chair of the Congressional Black Caucus, told the Washington Post last week that she was "overwhelmed" by all the support she's received from some of her Democratic colleagues, including Reps. Tim Ryan (Ohio) and Seth Moulton (Mass.). She also said that there are "probably closer to 30" Democrats who have privately told her they would be willing to vote against Pelosi. Sixteen House Democrats and incoming members of Congress signed and released a letter to their Democratic colleagues on Monday saying they were "thankful" for Pelosi's service, but they believed that it was time for new leadership. It is unclear whether one of the signees will challenge Pelosi now that Fudge is no longer mulling a bid. In addition to Pelosi's decision to tap Fudge as the chairwoman of the subcommittee, Politico reported on Tuesday that Fudge previously vouched for a former state lawmaker and judge in Ohio who is now accused of killing his ex-wife. It is unclear if this report impacted Fudge's decision not to run for speaker. This entry was posted in Politics and tagged House Democrats, James Clyburn, Nancy Pelosi, Seth Moulton, Steny Hoyer, Tim Ryan. Bookmark the permalink.